I almost never remember this anniversary, but yesterday it just hit me. Adam and I were both home sick with different bugs, and I was poking around in my calendar. And I realized that today is the 16th, and that’s my blog birthday. This site is so different than it was 7 years ago, but in some comforting ways it’s still like it was when I started. The photos are a little better (and bigger). And I don’t write about books as much as I used to. Probably because I do not read as much as I did before motherhood. I also don’t cook or sew as much with a tiny human running around, but I still love posting what I’m up to. This is still the scrapbook of my life. I posted 5 times on the day I started this blog, I was that excited. 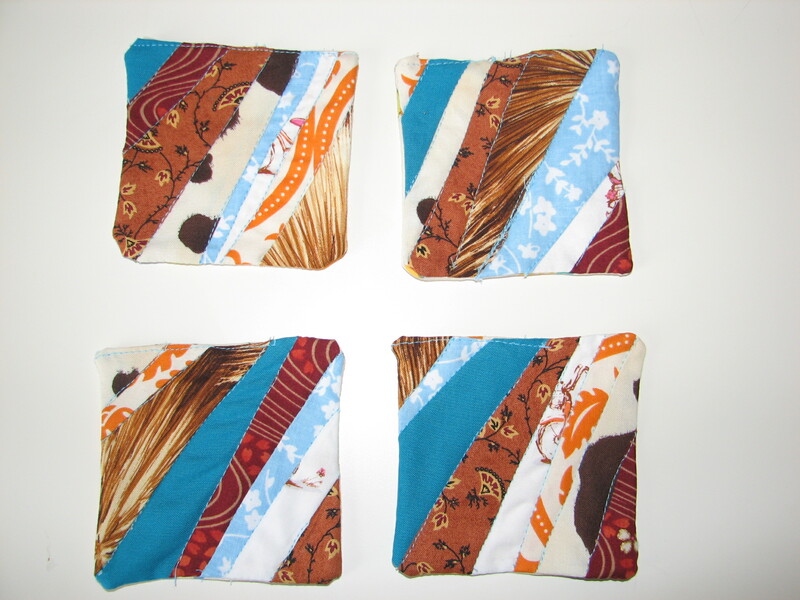 My very first post was about a set of coasters I made for my friend Maggie (the photo above). I had only been sewing for a couple of years then, and not very seriously. They were made with a ton of love, but honestly the construction is awful. I’m currently quilting a pretty elaborate wedding quilt for Maggie that I really hope to finish this month…I’ve come full circle! Newbie coasters to a double wedding ring quilt. 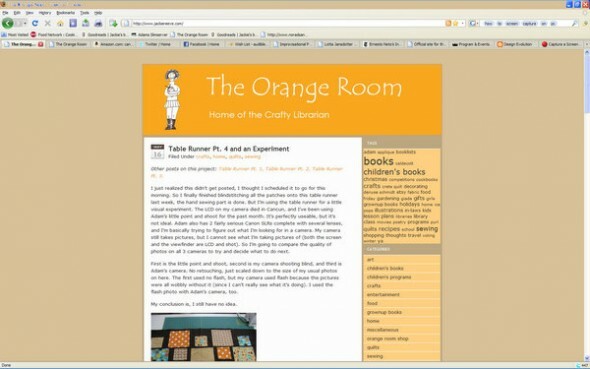 The original layout of The Orange Room. I also posted two book reviews and something about my latest program at the public library where I worked. I was 29, I’d been married a little less than a year, and I wasn’t a mom yet. I wasn’t even teaching yet. I hadn’t started writing freelance, and I hadn’t sold any quilts to a magazine. I hadn’t taken a year off from teaching. It was such a different version of me. This blog has had 5 makeovers. 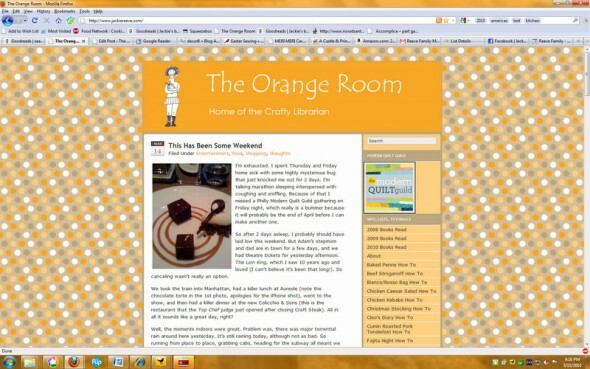 I’ve taken 25 trips since I started The Orange Room (including overnights and weekends). Had several different haircuts. I’d never made a quilt before, and now I’ve made 43. Plus a lot of other crafty goodies. I’ve met Julie Andrews and seen my writing in print. I’ve taught in 3 school districts. I’ve taken more than a thousand outfit selfies. I had H, and now she’s 3. This site is a record of a life, and a really happy one. Sometimes I vent, but mostly I don’t. Sometimes I feel like I’m talking to myself, but mostly I don’t. One year I stressed everyone around me out by insisting on posting every single day. The next year I gave myself a break and everyone’s hair stopped turning grey. Now I post when I have things to share. This post is giving me more ideas of things I want to share. It’s reminding me why I was so excited to have a blog in the first place. In the every day hustle and bustle I can forget that, but now I feel rejuvenated.